What Is A Bonner Leader? Bonner Leaders are Allegheny College students committed to working with local agencies in order to meet needs in the Meadville Community. Each Bonner student is placed with a local community organization. Bonner Leaders work to recruit volunteers, develop programs for their site, and provide much needed support for the agency. It’s a great opportunity to have a service-oriented position that provides students with practical, real life experience. There are a limited number of Bonner Leader positions offered to incoming First Year Students who demonstrate a commitment to service and interest in making service a priority during their Allegheny experience. First Year Bonner Leaders commitment begins during the first academic school year. Students interested in being considered for a First Year Bonner Leader position should apply via the online Bonner Leader Application. Selected candidates will receive an interview. Students beginning in the Bonner Leader Program during their first semester at Allegheny arrive to Allegheny for Bonner Program orientation a day before the regularly scheduled First Year orientation. These students first commit to two academic years and two summers of service. There are opportunities for students to stay with the program after their second academic year. These Bonner Leaders and Bonner Scholars enter Allegheny as a cohort. Bonner Leaders participate in regular meetings and leadership trainings. Bonner Leaders attend a fall overnight retreat and a one day spring training. Bonner Leaders participate in a first-year service trip and a second-year service exchange with another college/university Bonner Program. 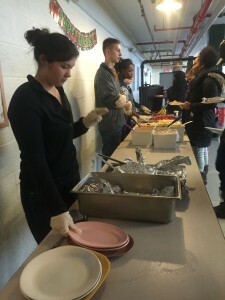 During the academic year, Bonner Leaders are compensated through Federal Work-Study or Campus Employment for 8-10 hours of service per week. Summers of Service: The first summer is completed in Meadville and the second summer is a service internship with a national or international community partner. Stipends are provided for both of these summer experiences. The summer of service experience is 300 hours and can be spread part-time throughout the three months of summer break or concentrated into 7-8 weeks of 35-40 hours of work per week. Up to $2,500 in work study funds for the 300 hours completed during the school year. Summer stipends during the first summer in Meadville and the 2nd Summer Away. A completed application must be submitted to the office of Civic Engagement, part of the Allegheny Gateway. Selected candidates will be interviewed as part of the application process.